Please read the Terms and Conditions on the back of this application form, before applying for your Bus Pass. Payment by cash – In person at the Finance Office (TreneereManor), Student Services (Nanjizal) or Transport Office (Zennor Z314). You can also pay with Credit/Debit Card by ringing the Finance office on 01736 335114before the deadline date. Note - You may be eligible for aREDUCED RATE BUS PASS (Bursary) please download a form from the websiteor call 01736 335165/ 01736 335120/01736 335155 for a copy. LOST PASSES: If you lose your Bus Pass please inform Penwith College Transport Staff immediately. REFUNDS: Refunds will be considered by Penwith College ONLY in the event of a student leaving College or changing address. The Truro and Penwith College transport scheme is available to all students. All of the buses used are service buses; a bus pass on this scheme offers flexibility of travel at a considerably reduced rate. First will provide main route bus services to arrive at the College by 09.00 and to depart after 16.15. Students will need to make their own way to and from home to the nearest bus stop. The Truro & Penwith College Bus Pass can also be used on evenings, weekends and holidays after 9am for any FIRST Service in Cornwall. Truro & Penwith College has no control over changes to normal service routes, or loss of routes, this responsibility does not lie with us, but we will make every effort to assist if this happens. 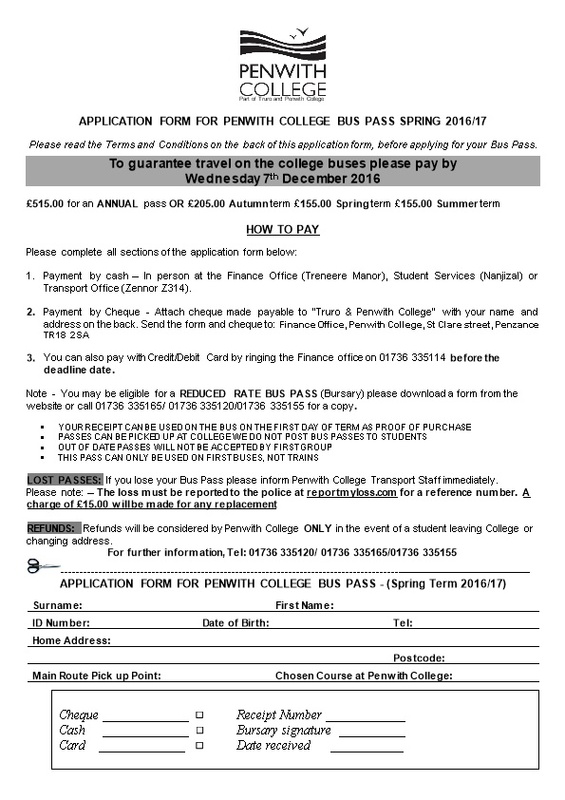 FIRST will allow all Truro & Penwith students in possession of a College Bus Pass to use the service as per Terms and Conditions below. TC1.The travel pass can be used between the inclusive dates shown. on other First local services where a ‘200’ route is not provided but only after 0900 hours. TC3.Where no ‘200’ series service is available for travel to/from Truro & Penwith College a normal First service may be used. apply during the summer holiday break where an expiry date of 31st August will be applied. TC6.The Travel pass must be shown to the driver on every journey. If no pass can be produced at the time of travel then the ordinary adult single fare must be paid. Altered, defaced or damaged tickets will not be accepted and will be withdrawn. TC7.The ticket is NOT transferable and does not give the holder priority over other passengers. It is issued subject to the rules and regulations of the company. TC8First will refuse to allow travel to any passenger who is abusing the rules and regulationsof the Company.